Whether a chic apartment with a view of the Eiffel tower, or a rustic farmhouse nestled in the rolling hills of Provence, the timeless style of the French is something we can all hope to emulate in our own homes, even if we live a world away from the delightful vineyards of Burgundy or Aquitaine. When looking for that ‘je ne sais quoi’ of French style what we are really after is a melding of the traditional with the modern, where cool pastels embrace priceless antiques and shabby furniture with égalité. French homes deplore bold colour on the walls, preferring creamy whites and hints of blue carried through to the furniture and furnishings. ‘French style’ is also about making epic statements, from baring walls and ceilings to highlight plaster mouldings, and floor length curtains that add vertical height to any room. But if you are lacking a period cottage or soaring Georgian ceilings, you can still capture a little of that French indulgence in your home with fires that capture all the modern functionality you want with a traditional look that has stepped straight out of a Loire Valley farmhouse. 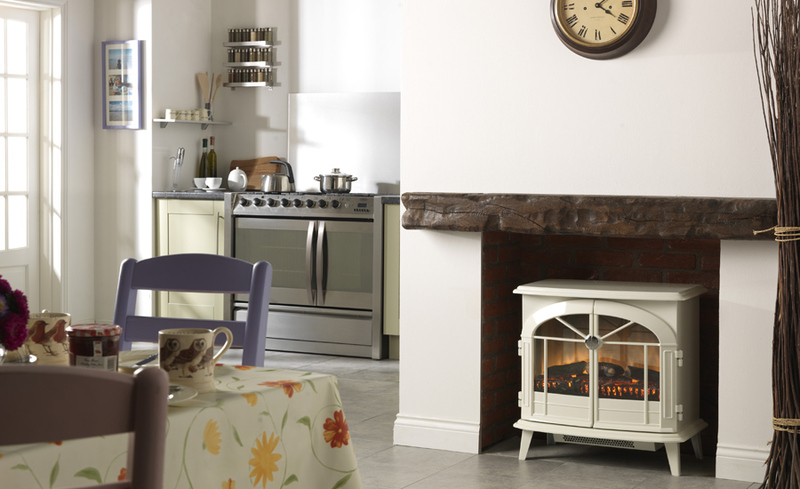 With the all-important creamy-white gloss colour finish and classic cast iron stove styling, the Chevalier electric stove from Dimplex’s award winning Optiflame range of fires, is the perfect way to make a statement as a centrepiece for any French inspired room. A contemporary design that features large picture window doors that can also be opened to fully reveal the realistic flickering flames, Chevalier provides a fuss free focal point in your room, with a thermostatically controlled concealed 2kW fan heater, operated manually or using a remote control. The Chevalier also comes complete with a choice of real coals or log effect fuel bed, and these can be easily swapped to provide a different look for the mood or season. For added realism, Grand Crème is an epic electric stove that delivers the deceivingly real looking Opti-myst three-dimensional flame and smoke effect. This effect can be used independently of heat, which makes it not only ideal for minimising energy costs, but also lets the illusion of a roaring fire continue throughout the year to banish those dull but mild British days and evenings. As both Chevalier and Grand Crème are electric, there is no need for complicated installation, chimney or flue. Just plug in, switch on and style your room around it for that perfect Gallic inspired space.